What is the situation in Estonian journalism? It is a little anxious. The reason is that something really has happened. We have had free and democratic press all this time, and now that concept is under attack. 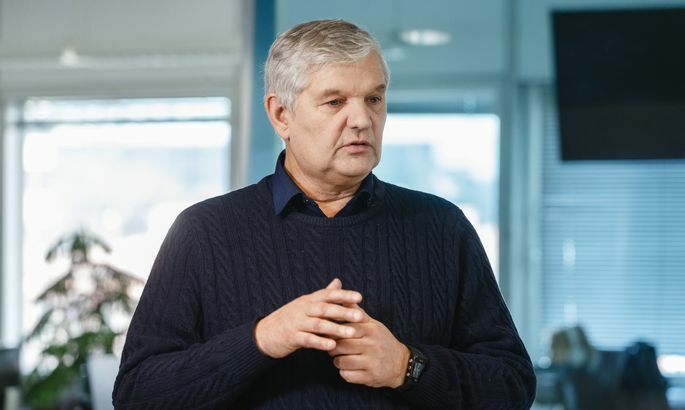 Two leading media groups are owned by Estonians again after a long while: Ekspress Grupp by Hans H. Luik and Postimees Group by Margus Linnamäe. What effect does that have on journalism? I doubt their nationality has anything to do with it. Rather, it is about attitudes and the ability to understand what the media is: whether it is a technical tool for promoting a worldview or whether it is one for independently informing society in an independent way. Things get dangerous when the media becomes the mouthpiece of a group of people, ideology etc. It is immediately visible in a country the size of Estonia. What effect to you attribute to ownership? I have not seen a situation where the people are happy with the press, nor do I see it as a probable development in the near future. I dislike certain signs that are in the air. In the past, Postimees was believed to be the Reform Party’s mouthpiece, while Päevaleht was considered a more left-wing publication. Can you currently see major dailies preferring the agendas of certain parties over others’? I prefer to rely on surveys in such matters. Once such myths start to stick – for example that Postimees is Isamaa’s version of the Kesknädal (Center Party newspaper – ed.) – it can do a lot of damage. It needs to be avoided at all costs. Papers need to avoid looking like a single party’s mouthpiece like the plague. It affects the leader, financial results, the whole of society. The political situation is complicated. Have journalists been up to their tasks? The image of the press has traditionally been very good in Estonia. It peaked around the time Estonia restored its independence when journalists chose the same path as the people – often by surrendering journalistic principles and choosing Estonia’s side. It was very difficult during Soviet time, but it was managed. That is why people trusted the press. The journalist’s profession started to fall from grace in the early 2000s as did salaries. And that process is ongoing. The general credibility of the press has never been so low, also in other countries. We are still relatively well off in Estonia. We still have a number of publications and people who are largely trusted. I cannot see us making do without journalists. On the unpleasant-accident-disaster scale, I would describe the current situation as unpleasant. It has not turned into an accident yet, but we need to keep it from moving there. Mart Helme (chairman of the Conservative People’s Party (EKRE) – ed.) recently said on ETV’s “Esimene stuudio” program that no positive stories of EKRE are published. Why is that? A great many stories have been written on EKRE politicians over the years. They have been given the floor regularly; if anything, they have received an advantage. That has been the boon of right-wing populist parties. EKRE has been lent support by the press for a long time, even though they might not see it that way. What is happening is elementary and could be no other way. If there is a chance a party will participate in forming the government, it is the task of the press to find out who they are, what to expect from them, what is their past, what they’ve said. For example, that ERR should be destroyed. That person might very well be a minister soon! Do only journalists have to take responsibility for their words? That is what I’ve gathered. It is nonsense. The responsibility is mutual. It is the job of the press to find out who will be leading us. Still, you have studied journalism and worked in the field for a long time. Could you write a positive story about EKRE? But it is not a matter of listing pros and cons. Stories follow events, circumstances. We write that which is crucial for society. Even experienced and meritorious journalists quickly resort to political posturing and forget the most sacred principles of journalism when they go into politics. Martin Helme, who is a member of the council of public broadcaster ERR, has proposed the removal of journalists who have “demonstrated bias”. How could that deliberation go and what could be the result? That proposal is just… I don’t have the words for it. It’s wrong to say the least. The broadcasting council needs to follow the law. Several politicians who make up that council have not had the slightest idea of how media works for the past 20 years. It is baffling that they never learn either; sociology, for instance. What they need to proceed from is that ERR’s product is not a single show but its entire program. That requires one to see the big picture. Politicians often interpret their role on the council as that of protecting their parties. Have ERR journalists erred somewhere? I can analyze specific programs. If there is a signal from the ombudsman or public criticism, we can go and discuss it. Let us take a specific example that has also been criticized by Postimees journalist Priit Pullerits. It is a piece by “AK. Nädal” where critical letters young people wrote to PM Jüri Ratas were read aloud. Were the editor and the journalist right to structure the program like that? Would I have done it? Hardly. If that is the method the journalist went with, then I – if I’m the editor-in-chief – have the right to tell him I didn’t like it. Delfi reported on March 20 that ERR’s ethics adviser Tarmu Tammerk has given journalists a set of guidelines for covering elections: special attention needs to be paid to impartiality as ERR has been accused of biased coverage. Tammerk said: “Remarks need to be taken into account in part and certain criticism is founded.” Is this kind of intervention justified? Tarmu Tammerk has his role. He is keeping an eye on program balance, processes criticism, draws conclusions and gives advice. Some of that advice is to be followed, while some is not, because journalists have their own choices to make: they work with their conscience. Tammerk is an experienced person, and I suppose he understands matters. However, it is wrong to generalize based on a single program. A member of the broadcasting council needs to be able to see the whole of ERR, all its channels. Rather, it has been EKRE’s style to label and go after individual journalists. It is unprofessional. It simply isn’t done. Isamaa member Mart Luik joined EKRE on Friday when he said the media is hysterical. To what extent is that word fitting, and in what should we see Mart Luik’s role. Using the word “hysterical” is unbecoming. Mart Luik has very quickly lost professional character in evaluating such situations and adopted a clearly political line. You said on Vikerraadio yesterday that society must clearly react to attacks against journalism. What should that reaction be? We have chosen our path: it is Europe, it is freedom, it is free press. We are seeing these fundamental values called into question. The media must be able to choose whether to write a story, convey meanings in a democratic country. Once these meanings start coming from the outside, we will cease being that country; we’ll be a different country. When I hear talk of putting the press on a shorter leash and the need to fire journalists, I perceive acute danger to the system of values that has brought us where we are and has done it very successfully. How should a journalist be able to ask questions and steer a debate in a situation where everything we have agreed on, including personal freedoms, protection of minorities, EU and NATO, right down to liberal democracy itself, is being called into question? Journalists are people too. They also have their own position and worldview. Publications often take stands and have obligations, including ERR. I have not seen major problems with interviews so far. One simply needs to follow their inner compass. How great is the danger of self-censorship in a situation where journalists and the press are under constant attack? Self-censorship is here already. I can see clear signs. The backbone of media executives is one of the strongest pillars Estonia has today. If that is weakened, a much bigger structure than we imagine might end up collapsing. We need to plant our feet and straighten our backs, resist provocation and attacks! It is absolutely inadmissible what we are seeing. What kind of effect could the incoming coalition have on the press? That depends on the latter. I understand the ordeals of my acquaintances in Poland and Hungary who woke up one day to find their country changed. They were startled to find they could no longer get back what they had. I believe that neither this nor the next coalition will introduce change as radical as what we fear, but we cannot afford to be sheep. We cannot let it all slip away.